Offering you a complete choice of products which include swaad piece tiffin set, deluxe atlas 2 tiffin and eat fresh 2 lunch box (with lock & seal lid). Number Of Containers 2 containers. 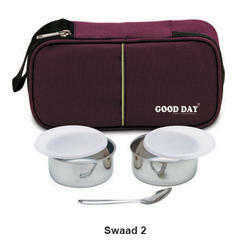 We are successfully ranked amongst the topnotch entity offering a wide range of Swaad 2 Piece Tiffin Set. 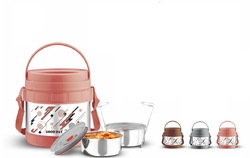 This tiffin set is manufactured by expert professionals utilizing quality materials and applying latest technology. Our professionals manufacture the tiffin set using optimum grade materials along with adhering to industry standards. Furthermore, we ensure to opt for strict quality inspection ensuring safety and reliability in tiffin set. Apart from this, clients can get the tiffin set from us at cost effective rates. Atlas- 2 steel Tiffin is solidly insulated with best quality PUF. - 2 S.S Leakproof containers with lifter. - The outer body is made of high quality stainless steel, which keeps food fresh, hygienic & odour free. - The super P.U. insulation keeps content hot for longer duration. - The plastic parts are made from 100 % food grade material. - Durable, virtually unbreakable & easy to carry. - Ideal for carrying home cooked food to office, collage, hospital & travel etc. Assisted by a qualified workforce and advanced manufacturing unit, we are engaged in offering a wide range of Eat fresh 2 Piece Tiffin Set. The offered tiffin set is made available in different sizes having diverse capacities. From 2, 3 & 4 pieces set is made available by us to the clients. 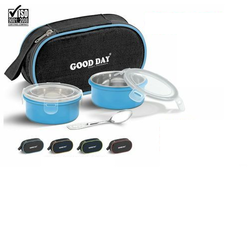 The offered tiffin set is attached with a small belt for crying tiffin set effortlessly. There are a variety of colors and designs provided with tiffin set. Also, provided tiffin set is made adhering to industry quality norms. - Compact Softline Lunch Box. - 2 S.s Inner Container. - One Extra S.s Spoon. - Leak Proof Airtight, Lock & Seal Lid.